Born in London, Ontario, Amanda Hickey’s inspiration stems from her love of travel. She has explored over 20 countries, and has been influenced by the history and significance of ceramics experienced on these adventures. Hickey has continued to craft her style through various classes explored at Sir Fleming College: Haliburton School of Art & Design, graduating on the Dean’s Honour Roll, which led to the construction of pieces that are unmistakably a Love Bite Ceramics creation. Love Bite Ceramics is an active member of the London Clay Art Centre. Her work can be found locally at Floral Theory and Museum London’s Muse Shop & Rental, and internationally at lovebiteceramics.etsy.com. 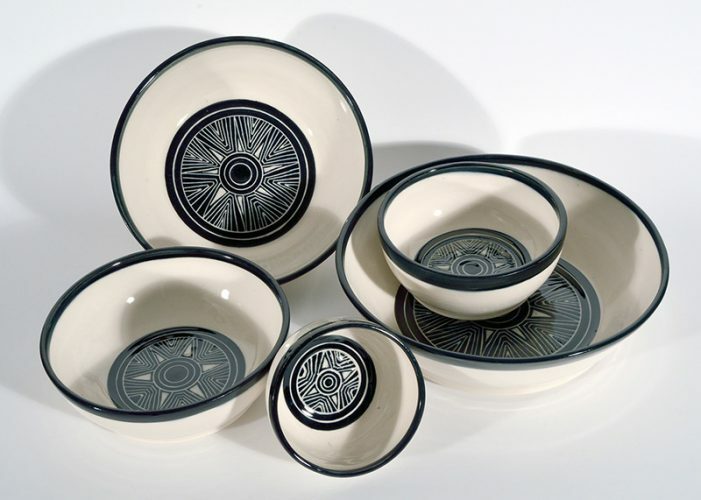 With almost a decade of working with stoneware, porcelain and practicing the graffito carving technique, Hickey is becoming a recognized artist across the province for her functional ware. Her work boldly animates the urban space with its (mostly) classic black and white trademark look, camouflaging perfectly into the modern home.